Seeing the previous posting of the Pet & Doll Show........and spotting my own, treasured Bride Doll....has just really had an exciting effect on me. Suddenly seeing an actual photograph of something held only as a memory all these years! 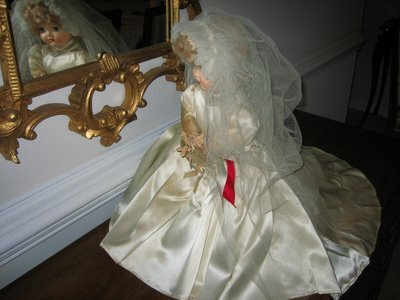 That doll was so, so special......far grander than anything I'd even seen, let alone had for myself. Perhaps my grandmother ("Miss Pearl" at The Smart Shop) had gathered scraps from alterations or something? She had fastened a "baby doll" to a stand, and then dressed her as a Bride, in rich satin and soft netting, little pearl beads and a tiny bouquet. I remembered entering her into those doll shows, and always winning ribbons......still amazed that she really was mine. 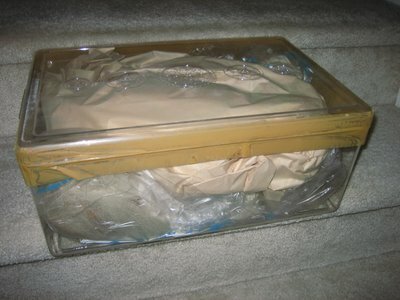 Suddenly feeling the excitement of that little girl again, I've spent some time climbing around in our basement storage, digging back through leftover boxes from past moves, until I found the "saved doll" container, packaged and taped years ago. I'm amazed that I still have it...........even more amazed at the size of this container. My first-grade memory of such a tall doll left me laughing as I pulled off the tape and opened the plastic box. The posting on this blog triggered the memory of my doll for me, and renewed my interest. And, it's made this Christmas....so many years after receiving the doll as a little girl....very special. I've left her sitting out, for my son and his fiancee to see when they visit this week. A wedding coming up in a few months...somehow this whole experience seems like no "coincidence". Rather, still another connection to the past and happy memories of growing up in Monroe, to share with my friends and family. Thank you for sharing this special Christmas experience...one that not only brought back fond memories but more importantly reminded you of your grandmother's love. This is one of those human interest stories you read about in magazines or see on TV. Just UNREAL! I'm pitching in with MF on this one - thanks for sharing. After all these years and you still have the prize winning doll and two pet show ribbons - Just UNBELIEVABLE! Happy New Year and good luck with that wedding!